It's a wonderful small kiln built for home use. It runs on a 30 amp dryer circuit. The AF3C comes standard with the AF3C 3-button controller, however you have the option to upgrade to the Orton Autofire 12-key controller, or the TAP touch screen controller. 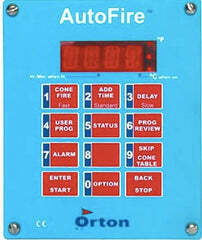 You can add multiple thermocuples for zone control with the Orton AutoFire 12-key controller. This option is not avalible with the other controllers. Inside Dimensions 18" x 22"
After only one glaze in my new Jen-Ken kiln I know I’ll never switch. I’ve found TJ to be extremely helpful and prompt our email exchanges. I had a “newbe” question after the kiln arrives and the lady answering the phone was courteous and gave me the response I needed without making me feel silly for asking!